Posts Tagged "social media statistics"
Yesterday (September 11th) Nielsen released their “State of the Media: The Social Media Report” which “looks at trends and consumption patterns across social media platforms in the U.S. and other major markets, exploring the rising influence of social media on consumer behavior”. 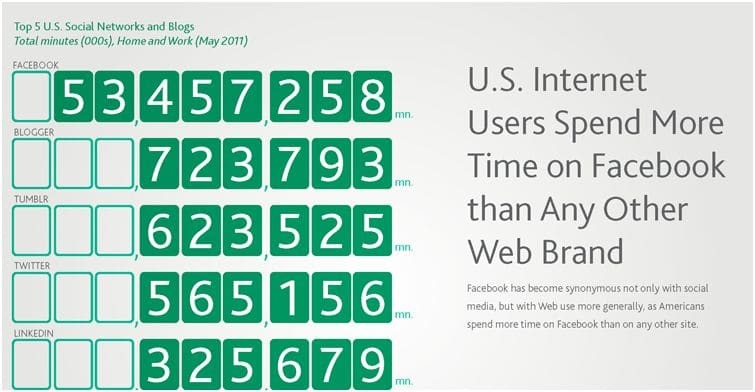 It’s no surprise that Americans spend more time on Facebook than any other website. From my FB friends who say they’re addicted to it and take frequent Facebook fasts, to the amount of people (is it 750 million now?) who are on the social networking site. It’s also no surprise that nearly 40% of social media users are accessing the content from their phone. Especially after the article I posted today of the prediction about where PCs will be by 2015. You can read the full report here. From the highlights I posted, are than any statistics and trends that surprised you? Among one of the many interesting findings from Dan’s study is that when users want to share content on a one-to-one basis, blogs appear to be the preferred method of information distribution. I find it interesting that blogs are so popular in one-to-one sharing relationships, I would have thought that blogs would have been more widely used for broadcast messages that are designed to reach a large group of people. If you want more information from the report you can get it by visiting this link. You may have to register to view the full report or you can visit the above link from Nowsourcing to get a brief snippet. I do not have information as to how the data was obtained or what sources data was obtained from, this is something you get once you register with Dan. did you check out the post on Nowsourcing, where you surprised by any of the results?